When you have bad bacteria and fungus in your gut, you need to clear it out, then re-seed with beneficial bacteria and restore a healthy intestinal lining. This will support normal digestive function. 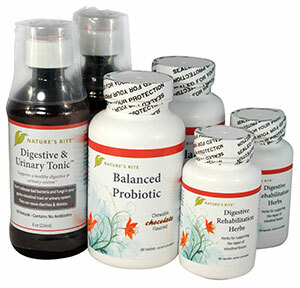 More and more people are struggling to maintain a healthy digestive system. Our damaged food supply and dependence on antibiotics has caused terrible damage to our digestive systems by shifting the flora in our gut. As we take vitamins and minerals in all forms and at surprising costs, we are missing the biggest question of all: are we absorbing these products? We consume huge amounts of beneficial cultures in the form of Probiotics but don’t address the need to clear out the bad cultures and fungus first. We do herbal cleanses and purges but do we take herbs to help us heal and re-construct the damaged intestinal lining? Did your last cleanse or purge or probiotics fall short of the mark? Do you scrutinize the “quality and absorbability” of the vitamins and mineral supplements but never consider the ability of our gut to deliver them to the blood. Do you buy organic foods, eat raw vegetables but don’t have the what’s necessary to break-down and help absorb the nutritional value that they offer. Do you study and question the types and freshness of stomach enzymes in our probiotics, but throw them into a quagmire of poor stomach cultures and fungus where they have to fight for their lives. Would you throw expensive grass seed onto a lawn full of weeds? Of course not. And after you’ve purged, cleansed, and otherwise “cleared-out” the gut, did you support the body’s natural healing process with regenerative herbs? Let’s do it right this time so it works. Let’s do all the right steps in the right order. Let’s do a complete Digestive Support Cleanse, re-seed, restore. (2) 60 capsule bottles of Digestive Support Herbs to facilitate the body’s natural process of repairing the intestinal lining. The Digestive Support Herbs are designed to support in the rebuilding of the epithelial lining while protecting and improving lubricity. (Purchased separately, this would cost $191.94, but the Digestive Rehabilitation Kit provides everything you need and the instructions on how to make this work for $149.99). Xylitol, Natural Flavors, Chocolate Powder, Searic Acid, Magnesium Stearate and Silicon Dioxide.